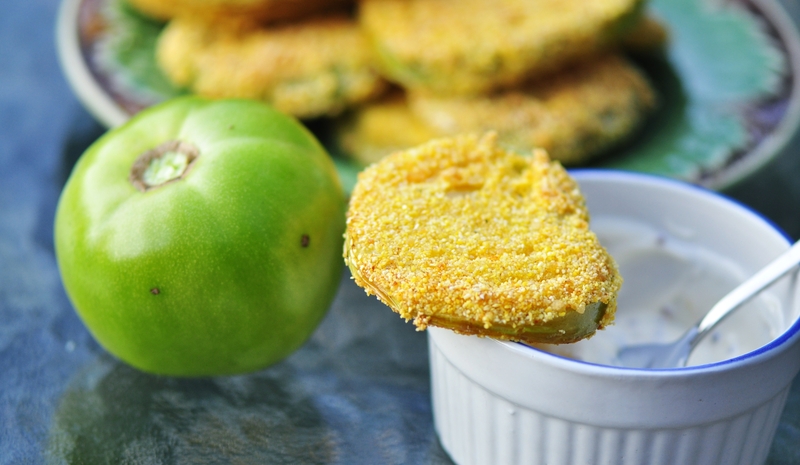 Fried green tomatoes are a Southern classic which are gluten-free, easy to make and can be used in a handful of different types of dishes. Just to be clear, green tomatoes aren’t a different kind of tomato from red ones. They’re just unripened tomatoes, which are harder and a bit more sour. 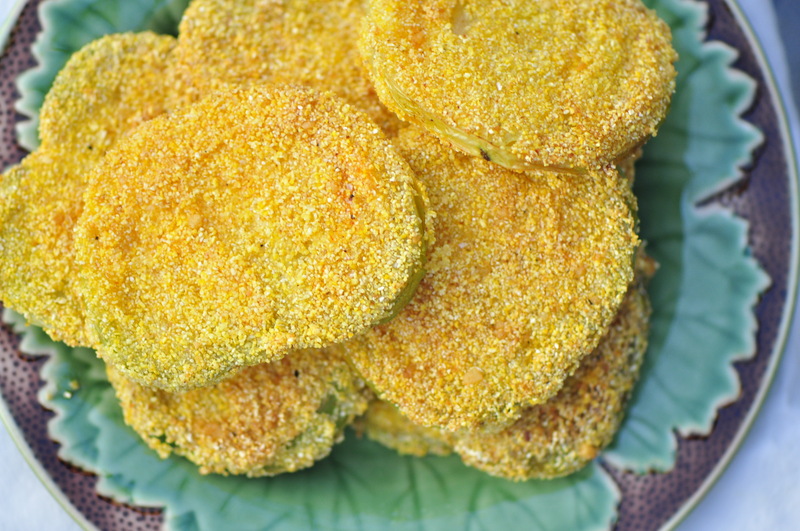 When fried, they soften while still holding their shape and can be used as an appetizer or filling for sandwiches. 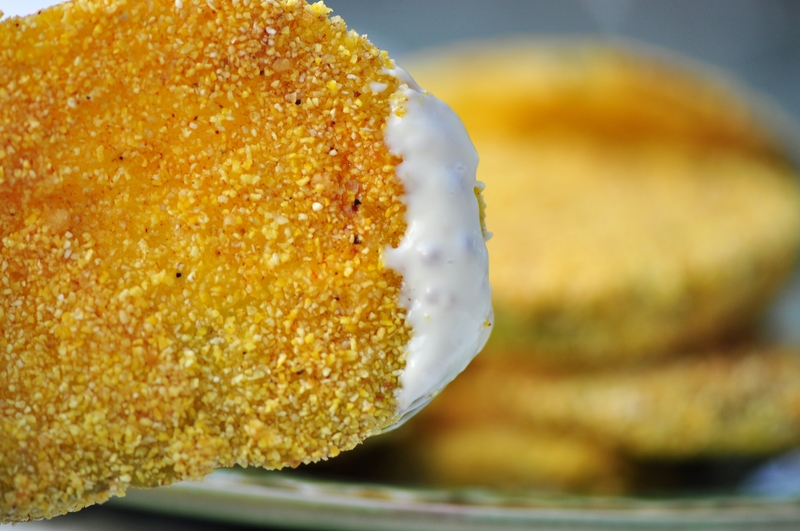 I once had a fried green tomato po’ boy (which is a Southern-style sandwich) and it was great, but I believe the restaurant used flour in their coating. I decided to stick only to cornmeal because it’s lighter and crunchier. Lay tomato slices over paper towels and sprinkle 1/2 tsp. salt over them evenly. Let sit 20 minutes and pat off any excess liquid. In a medium-sized bowl, mix cornstarch, smoked paprika, pepper, 1/2 tsp. salt and parmesan cheese. Set aside. Heat oil in a drying pan over high heat (there should be just enough oil to cover the surface of the pan). Dip a tomato slice in the egg wash, then into the cornmeal mixture. Place slice in hot oil, and repeat with as many slices that will fit into the pan at once without over-crowding. Fry on each side for 2-3 minutes, carefully turning slices over with a pair of tongs. The coating is fragile and can chip off if flipped too roughly. Repeat with remaining slices as necessary, changing the oil if it becomes too dirty. Serve hot with your favourite dipping sauce, or in a sandwich. yummm…I love these. I have a recipe for them in my first cookbook too! 🙂 your photo looks great.